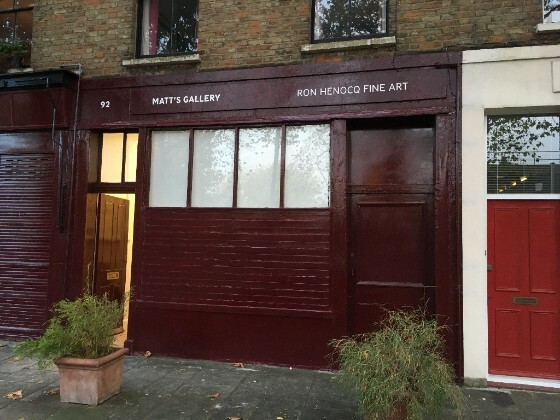 Matt’s Gallery is pleased to announce that in January 2018 it will move to Ron Henocq Fine Art, 92 Webster Road, Bermondsey, London, SE16 4DF. Located next door to Coleman Project Space and a few minutes walk from CGP London/Dilston Grove, 92 was home to the artists Roger Shaw and Alexis Hunter in the 1970s. Following this it served as Ron Henocq’s studio and the office for Cafe Gallery and the Bermondsey Artist Group. Henocq founded Cafe Gallery (now CGP London) in the derelict Lido Café building in Southwark Park in 1984. The move represents an old adventure in a new place for Matt’s Gallery, returning to its original ethos with the confidence and conviction of its 38 year history behind it. In keeping with its founding spirit the gallery is seen as a brief but concentrated stopover for new work to be experienced or checked – as much by the artist as by anyone else who may be really interested. Studio spaces and practice have always been at the heart of Matt’s Gallery, which was founded in Robin Klassnik’s studio in 1979, and has always been sited in studio complexes (SPACE and ACME). Matt’s Gallery is delighted to continue making Bermondsey its temporary home into 2018. 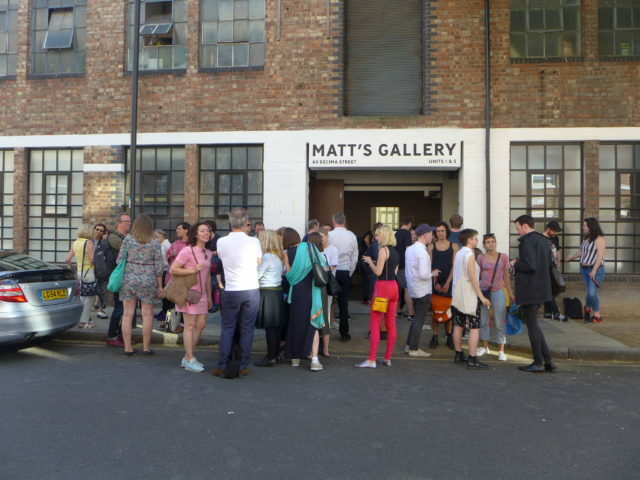 In 2019/20 it is anticipated that the Gallery will move to a permanent 9000 square foot, double-height gallery space in Nine Elms on the South Bank, marking the next phase of an exciting future for Matt’s Gallery. Matt’s Gallery would like to thank Ron Henocq for his kind support in making this possible. David Austen, The Drowned, 2017. Image courtesy of the artist. 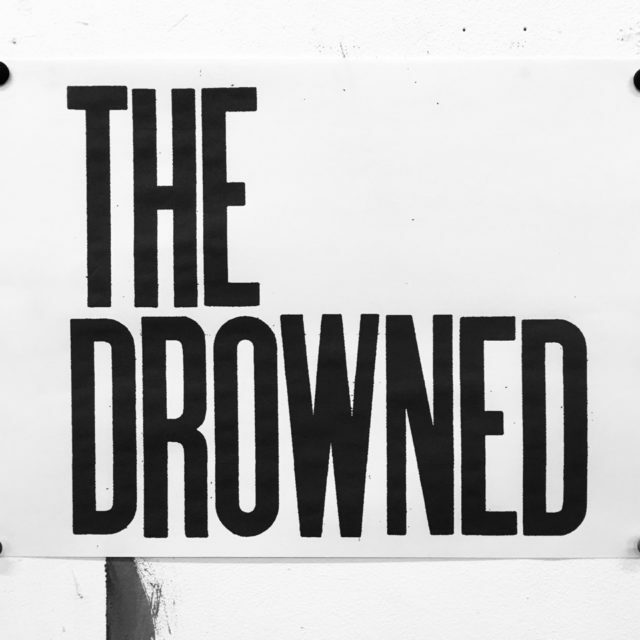 David Austen’s solo presentation, The Drowned, will be the first show at Matt’s Gallery’s new space in 92 Webster Road. In the coming months, Matt’s Gallery will present a rapid succession of short exhibitions and events. The Gallery’s practice of working with artists of different generations will continue with an open ended, vibrant and responsive programme of artists presentations and guest-curated shows. The Stanley Picker Traineeship, now in its 10th year, is a unique opportunity for a recent graduate or postgraduate to gain valuable professional development experience, working as part of a gallery team. The traineeship is offered on a part-time basis for 6 months, February – July 2018, (two consecutive days per week). A bursary of £2,500 will be paid over the course of the placement. The new Stanley Picker trainee will work on a programme of artist presentations and guest-curated shows at the new 92 Webster Road gallery, an offsite ‘Meanwhile’ project at Nine Elms, Wandsworth, as well as contribute to artist Lindsay Seers’ ambitious new touring project ‘Every Thought There Ever Was’. To apply please download and fill in the application form and equal opportunities form from here and please submit these along with a CV via this link. 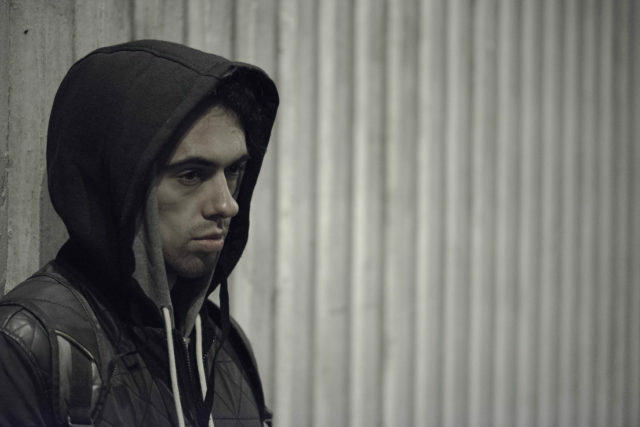 Possessions_inc is a video and web project by Matt’s Gallery and Richard Grayson. Episode 18 is currently available to watch. 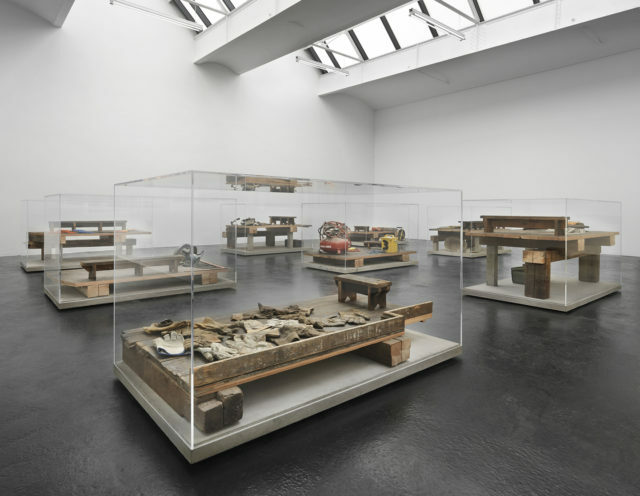 Mike Nelson, tools that see (the possessions of a thief) 1986–2005, Installation view at neugerriemschneider, Berlin, 2016. Image courtesy the artist and neugerriemschneider, Berlin. 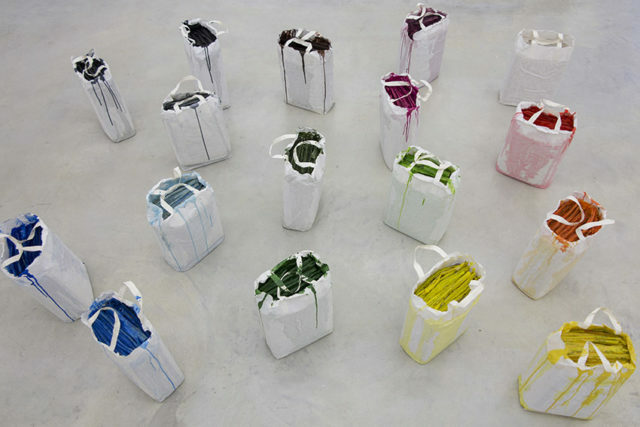 Mike Nelson is participating in the inaugural group exhibition for ICA Miami’s new building. 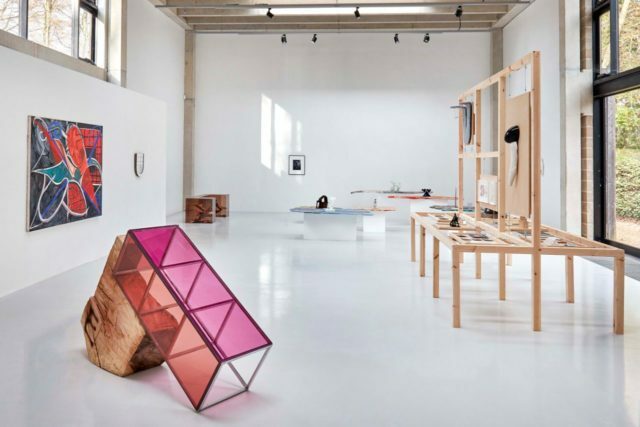 The Everywhere Studio is a thematic exhibition that brings together over 50 artists from the past five decades to reveal the artist’s studio as a charged site that has both predicted and responded to broader social and economic changes of our time. Organised by Alex Gartenfeld, Gean Moreno and Stephanie Seidel, the exhibition will include Nelson’s tools that see (possessions of a thief) – compressor. Through a combination of post-war artists through emerging practitioners—including Mike Nelson, Pablo Picasso, Yves Klein, Philip Guston, Bruce Nauman, Carolee Schneemann, Dieter Roth, Andy Warhol, Martin Kippenberger, Rosemarie Trockel, Elaine Sturtevant, Anna Oppermann, Joyce Pensato, Andrea Zittel, and Tetsumi Kudo, among others—the exhibition aims to create intergenerational dialogues that enhance understanding of the most innovative artists working today. Jarosław Kozłowski, News Games, 2014. Installation view. © the artist. Image courtesy of ŻAK | BRANICKA. ŻAK | BRANICKA is delighted to present the exhibition Words and Colors with works by Jarosław Kozłowski – the artist’s first solo exhibition and likewise the beginning of his cooperation with the gallery. Kozłowski is a legend in Polish conceptual art. Already long before the Cold War period had come to an end, his studio opened a window towards Western Europe: in the early 1970s, he established the artist network NET with over 350 international artists (thereby also arousing the interest of the secret service) and was a central protagonist of the Fluxus movement in Poland. In 1977, he organized a Fluxus festival at the gallery Akumulatory 2 (1972–90) that he founded, exhibiting the artists Richard Long, Reiner Ruthenbeck, Franz Erhard Walther, Victor Burgin, and Douglas Huebler, among others. Melanie Jackson, 2017. Image courtesy of the artist. 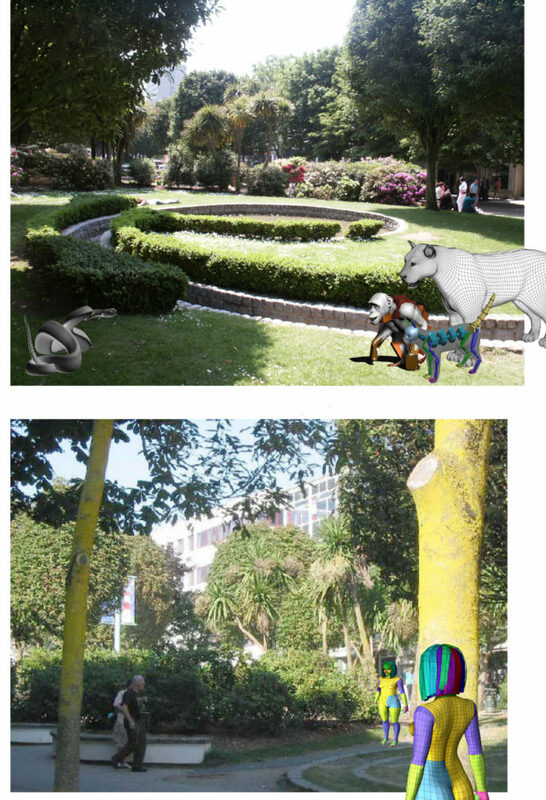 Melanie Jackson is presenting at the inaugural events programme of the Atlantic Project – a pilot for a new international festival of contemporary art, taking place in public contexts and outdoor locations across Plymouth, UK, from September 28, 2018. Participating artists include Melanie Jackson, Ursula Biemann, Liu Chuang, Nilbar Güreş, Ryoji Ikeda, Kiluanji Kia Henda, Marie Lund, Wang Shang, Hito Steyerl, Tommy Støckel and SUPERFLEX, amongst others. Curated by Tom Trevor, the project has been developed as a partnership between The Box and Plymouth University, hosted by Peninsula Arts, in the lead-up to the Mayflower 400 anniversary in 2020. 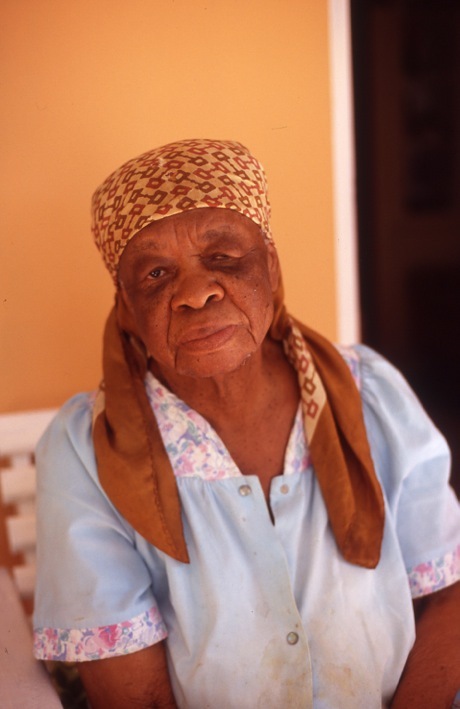 On the 5 Debember, Jackson will present in conversation with Esther Leslie for Atlantic Dialogue #4, with the title Milk. The Sleeping Procession, 2017. Installation view. Image courtesy of the CASS Sculpture Foundation. Lindsay Seers is exhibiting as part of The Sleeping Procession, a group exhibition co-curated by artists Gabriel Hartley and Sean Steadman in response to CASS’ special collection of maquettes. Through an extension of their engagement in painting, drawing and sculpture, Hartley and Steadman have produced a number of steel, MDF and resin architectural structures to display a selection of the CASS maquettes. In order to re-contextualise this collection they have also invited a pool of contemporary artists – Lindsay Seers, Phillip King, Eduardo Palozzi, Dieter Roth and Bill Woodrow – to display pre-existing and newly commissioned works. These will act to disrupt and re-frame the historical works taken from the CASS special collection. Using the idea of the maquette as a catalyst, this exhibition will explore the aspects under which art is emergent, how it is a compound of memory and expectancy and a site of accident and recuperation. Lindsay Seers, Suffering, 2017. 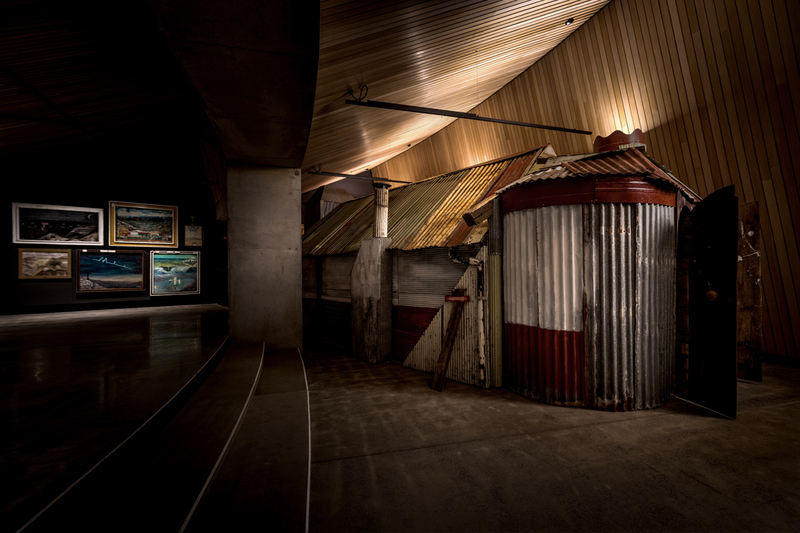 Installation view at MONA, Tasmania. Image courtesy of the artist. Graham Fagen, Roselle, 2006. Image courtesy of the artist. Graham Fagen is showing works as part of Burns Unbroke, an innovative visual arts programme featuring pieces by over 30 visual artists including new commissions by four artists living and working in Scotland. Each artist explores an aspect of the Scottish poet and lyricist Robert Burns’s life or work, highlighting his continuing relevance in the 21st century. 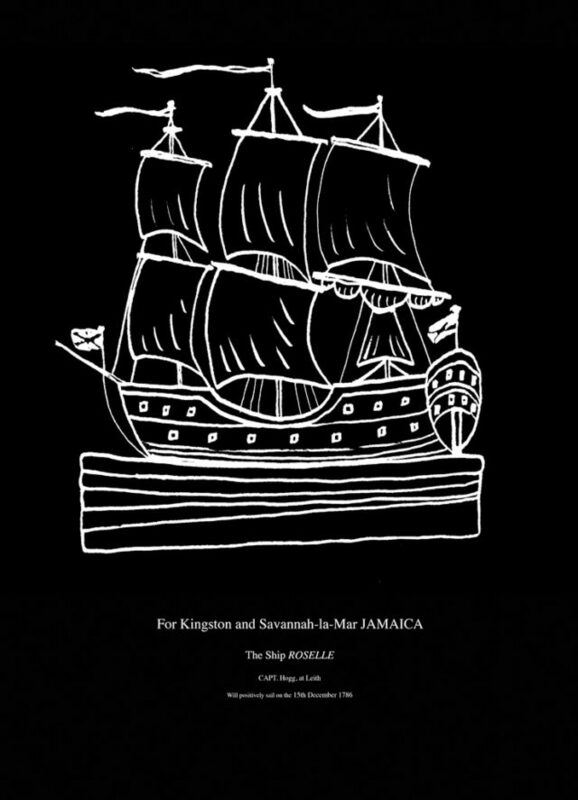 Fagen will be exhibiting a selection of Burns themed sculptures, film and prints in Medows Galleries I – IV. In addition, off-site, is A Drama in time, a Burns inspired work on permanent public display at Jacob’s Ladder. 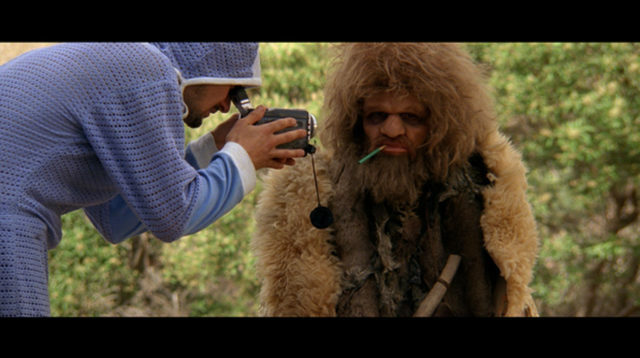 Nathaniel Mellors, The Sophisticated Neanderthal Interview, 2012. Video Still. Image courtesy of the artist. Nathaniel Mellors’ solo exhibition Neanderthal Narratives at Rome’s MONITOR features the video works The Sophisticated Neanderthal Interview (2012), Neanderthal Container (2013) and a new single-channel video version of Mellor’s collaborative work with Erkka Nissinen The Aalto Natives, originally presented at Finnish Pavilion at the Venice Biennale. 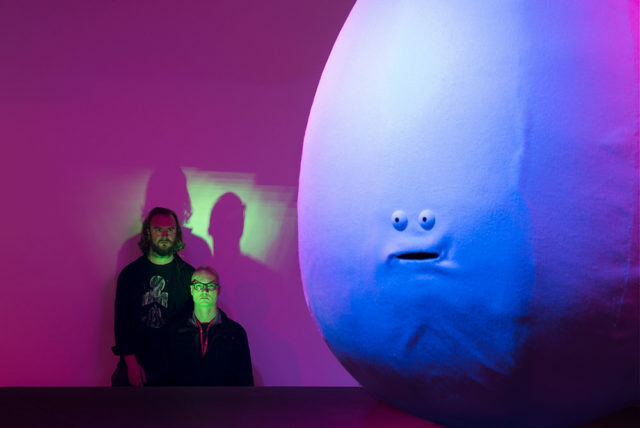 Nathaniel Mellors and Erkka Nissinen’s The Aalto Natives, presented at the Finnish Pavilion at the 57th Venice Biennale, is touring to the Cobra Museum of Modern Art in the Netherlands. The artists share an interest in narrative fiction, and employ an irreverent and often transgressive form of satire to critique power structures, morality and the status quo. The Aalto Natives brings together Nissinen’s intuitive, do-it-yourself attitude to digital animation and his penchant for naïve musicality, with Mellors’ writing-based approach to filmmaking, and integration of sculpture.“The Aalto Natives explores themes such as the invention of the nation state and the origins of culture by way of absurdist satire. Dressing its intellectual ambitions in deceivingly comical gear, the work addresses the complex challenges our globalized world faces today, like neoconservative nationalism, intolerance, and class polarization,” says curator Xander Karskens. Conflating ideas and tropes from archaeology, anthropology and science fiction, the work re-imagines Finnish society through the eyes of two messianic outsider figures, who offer a cosmic-comic perspective on Finnish creation mythology, contemporary Finnish society, and its possible futures. An event on 9 January 2018 organised by EYE Filmmuseum as part of the series Eye on Art, in response to the exhibition The Aalto Natives, will feature a selection films by both Mellors and Nissinen, some of which have never been shown in the Netherlands. Xander Karskens, the artistic director of the Cobra Museum and curator of the Finnish pavilion at the Venice Biennale, introduces the evening. 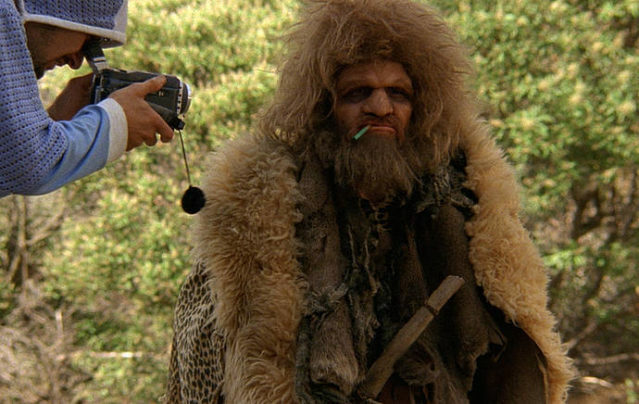 Nathaniel Mellors’ The Sophisticated Neanderthal Interview is being screened as part of the group exhibition Beyond Future is Past that includes ten current positions of international artists in the field of video/film. Artist include Nathaniel Mellors, Josefin Arnell, Ulu Brown & Roland Rauschmeier, Omer Fast, Isa Genzken, Shana Moulton, Janis Rafa, Stephen G Rhodes, Hito Steyerl and Ryan Trecartin. On the one hand, the contributions can be compared in their pleasurable and concentrated way of dealing with the pictorial worlds and viewing habits of our time. However, it is not about appropriation, an appropriating repetition or media criticism. Rather, a subjective approach is observed with which the universally available image and data material is rearranged, mounted, interconnected or translated. 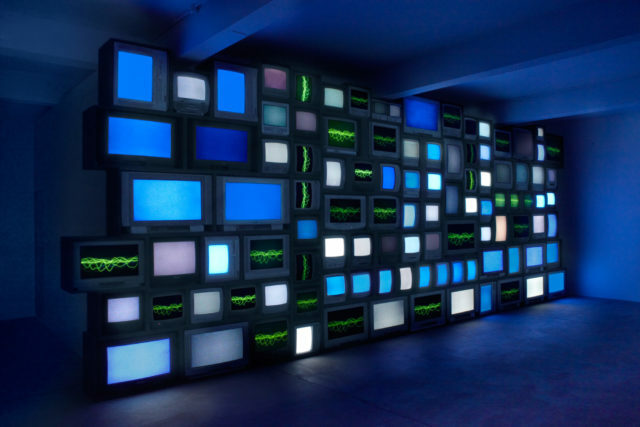 Susan Hiller, Channels, 2013. Installation photograph by Peter White. Image courtesy the artist, Timothy Taylor Gallery and Matt’s Gallery, London. Susan Hiller’s vast audio-sculptural installation Channels, commissioned by Matt’s Gallery in 2013, is shown as part of the group exhibition EVERYTHING AT ONCE, presented by Lisson Gallery with The Vinyl Factory. The wall of 100 television screens beaming out Channels are records and testimonies of those who have suffered near death experiences or claim to have glimpsed the hereafter. Lisson Gallery opened on Bell Street in 1967, a year after John Cage’s pronouncement on the changing conditions of contemporary existence. In celebration of this anniversary, the gallery is partnering with The Vinyl Factory to stage EVERYTHING AT ONCE, an ambitious group exhibition inspired by these words, which could very well apply to our current anxiety-ridden age of ceaseless communication. Through new and historical works by 24 of the artists currently shown by Lisson Gallery (out of more than 150 to have had solo shows over the past 50 years), this extensive presentation aims to collapse half a century of artistic endeavour under one roof, while telescoping its original aims into an unknowable future. 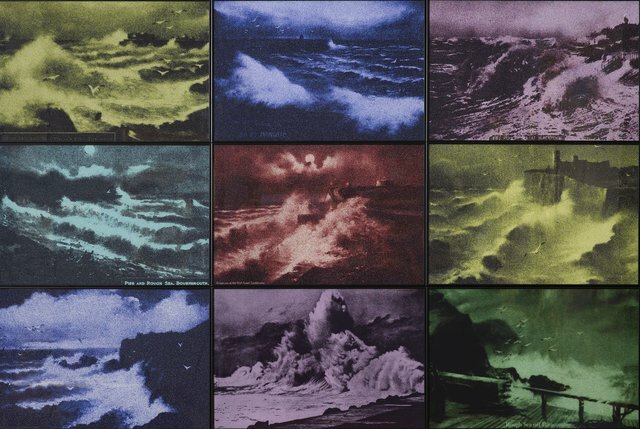 Susan Hiller is featured in an exhibition celebrating the legacy of Joseph Mallord William Turner, considering his impact through the lens of contemporary art and highlighting the ongoing relevance of this work for artists practicing today. The show will present a selection of paintings, sketchbooks, diagrams and works on paper from the Turner Bequest, alongside existing work by contemporary artists who have made work after Turner or evoke typically Turnerian subjects in their work. Dorothy Cross and Jonathan Wright have been specially commissioned by The New Art Gallery Walsall to produce a new work each in response to Turner’s art. Legacies is presented as part of a three-year partnership with Tate involving major loans from the Tate collection to exhibitions at The New Art Gallery Walsall. Roy Voss, The Way Things Are, 2017. Co-commissioned by De La Warr Pavilion, Grundy Art Gallery and Berwick Visual Arts. Installation view. Image courtesy of the artist and Matt’s Gallery, London. 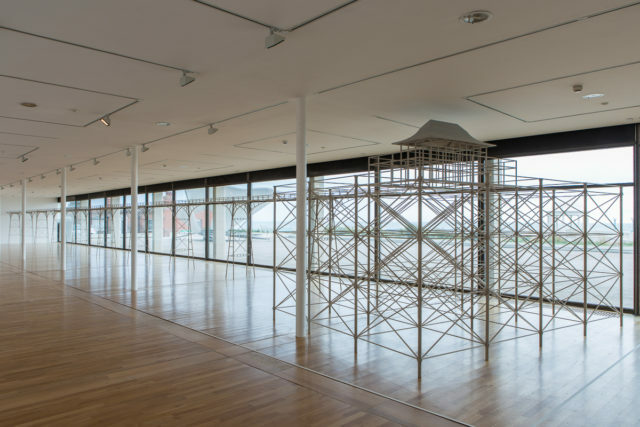 Roy Voss’ new commission The Way Things Are is a sculpture that stretches the length of the De La Warr Pavilion’s ground floor gallery space. Constructed from machined and push-jointed wood, the sculpture’s form is drawn from the artist’s memories and from Victorian lithographs. It is a delicate and precise skeletal form that resembles an idea of a pier. Voss finds something simultaneously prosaic and profound about the British seaside pier: offering a familiar but inscrutable promise of enjoyment, there is a simple impulse to reach the end, with the melancholic yet reassuring certainty of returning. The Way Things Are is a co-commission between Maltings in Berwick and Grundy Art Gallery in Blackpool, where it will tour next year. Michael Curran, SAPLM, 2017. Image courtesy of the artist. Michael Curran is collaborating with George McFall as The Sacred and Profane Love Machine and will begin studio recording for the forthcoming concept album SAPLM in January. This will be in preparation for a series of audio visual performances later in 2018. 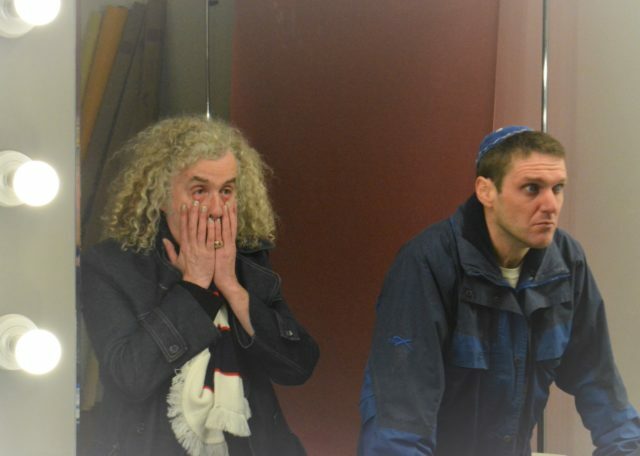 Curran will also begin work on a curatorial project FEAR VISITS LOVE. Willie Doherty, Home (Waiting), 2016. Pigment print, 71 x 106 cm. Image courtesy of the artist. Willie Doherty’s eighth solo exhibition at the Galerie Peter Kilchmann is centred around the video work Home (Waiting). This two-channel video installation, which was originally produced in 2016 for the Museum Villa Merkel, Esslingen and presented there in the same year, addresses the problem of migration, as on a double-sided video screen displaces the viewer from two sides into a remote transit zone. The installation is accompanied by six photographic works in various formats which were created in connection with the video work. Willie Doherty, At The Border, Anapra Road, New Mexico , 2017. Pigment print, 103 x 183cm. Image courtesy of the artist. Willie Doherty is exhibiting alongside Mona Hatoum and Rita McBride at Alexander and Bonin gallery in New York. 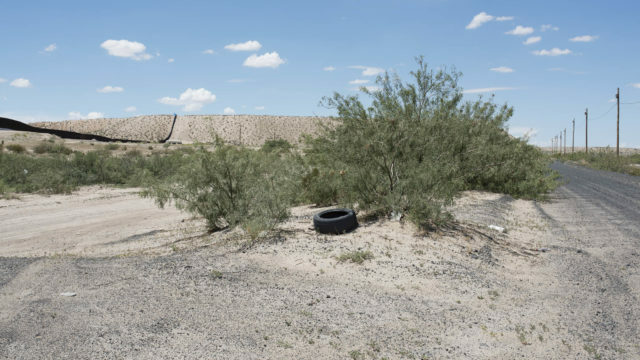 Doherty presents recent photographic and video works made along the US-Mexico border and on the outskirts of Pittsburgh. As with much of Doherty’s earlier work made at the contested Irish border, the images taken near El Paso and their titles allude to situations beyond what is visible in the photograph; to precarious conditions, uncertainty, and an escalating erosion of tolerance in the negotiation of frontiers and national boundaries. Doherty’s No Return (2017), a single channel projection, is installed in the video gallery. No Return was shot in an area once known as the “cradle of Western Pennsylvania’s steel industry,” before suffering from its collapse in the 1980s. Photographs taken in the same location will also be on view. Presenting the town’s derelict buildings and decaying urban landscape, the images are suffused with a sense of unease that echoes the site’s past social, economic, and ecological anxieties. Imogen Stidworthy, Castrato, 2016-19. Video Still. Image courtesy of the artist. 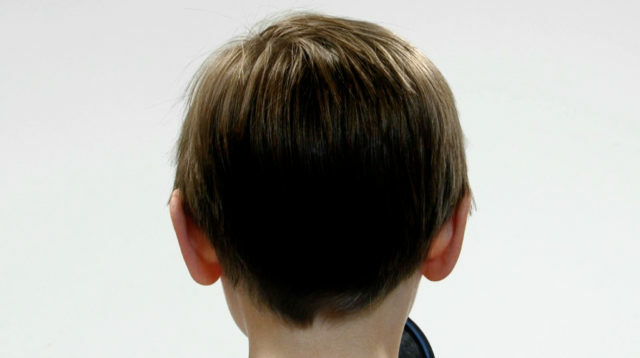 Imogen Stidworthy is exhibiting Castrato (2016-19) and ALEX (2003) as part of This is a Voice, an exhibition exploring the human voice and contemplating the power of voice before and beyond words. Blending performance, video, visuals and sound, the show presents works by artists and vocalists, punctuated by paintings, manuscripts, medical illustrations and ethnographic objects. The press release invites one to “experience the human voice, how it locates us socially, geographically and psychologically, and learn how the voice is utterly flexible and can be altered with treatment and training.” This is a Voice is a Wellcome Collection exhibition produced in collaboration with the Museum of Applied Arts and Sciences (MAAS).